Wednesday 14th October Makers Markets | Wandering Cooks | South Brisbane Wandering Cooks are kicking off their Makers Markets this week, a new weekly event where local food makers from around Brisbane will gather to feed you eats that are all ethically sourced and made from scratch. This week, Vira Lata and Ugly Food & Co will be dishing up international feeds, while Picklehead Pickles will be hosting a Q&A into all things pickles. The event kicks off from 5pm and is free to enter. Cooking class | Wholesomeness | The Grange Want to know how to make food prep healthier and easier? Book in for a cooking class at Wholesomeness, where you’ll learn how to create nutritious meals from a healthy (and budget friendly) shopping list. With healthy smoothies, functional food snacks and quick and delicious dinners guaranteed to give you more energy but not take up all your time and money, you’ll be feeling more wholesome in no time. Thursday 15th October Jägermeister Party | Bavarian Bier Cafe | CBD Have you got the moves like Jager? Keep the Oktoberfest celebrations going at Bavarian Bier Cafe’s Jägermeister parties! Knock back Flying Stags, Jäger shots, and refreshing steins aplenty while you listen to live music and line your stomach with a few pretzels! Meet the Maker Dinner | Lutece | Bardon Named one of the top five wineries in the world, Peregrine Wines is coming to Lutece Bistro for an evening of indulgence. Enjoy a five course dinner with a New Zealand touch and hear Alison Vidoni from Peregrine talk about the accompanying boutique wines. Contact Lutece to book. Friday 16th October Opening day | Wolff Röst House | Hendra Can’t get through Monday morning without that smooth coffee hit? If you’re already a fan of Wolff Coffee Roasters and their full-bodied blends, you’ll be happy to know they’ve just opened up their warehouse to the public, complete with the Big Bad Wolff Espresso Bar for quick coffee stops. Stop in and sample their brews at 140 Gerler Road, Hendra. Saturday 17th October Pastry Masterclass | Sofitel | CBD You’ll be able to whip up everyone’s favourite French pastries after a French pastry cooking masterclass with the Sofitel’s Chef de Cuisine, Joel Helot. You’ll learn how to whip up a chocolate mousse, decorate a cake and even get to tuck into the Sofitel’s iconic high tea for the $180 ticket price. Dining in the dark | Casa Di Louie | Wynnum Ready to uses all your senses and dine in the dark (and possibly make a mess)? Casa Di Louie is hosting a 4 course dinner with a difference – you’ll be dining blindfolded! Enjoy Italian and Mediterranean cuisine without using your eyes for $60pp, with a raffle to benefit Vision Australia on the night. Contact the restaurant to book. Sunday 18th October Food Truck Laneway Sundays | Stones Corner Hotel | Stones Corner Food Truck Laneway Sundays take over the Stones Corner Hotel on the third Sunday of every month, filling the hotel’s outdoor laneways with seating, fairy lights, live music and plenty of food and booze. Some of Brisbane’s best food trucks will be coming along, including the likes of Bella BBQ, Fire’N’Dough, Gourmet H-Dogz and Vira Lata. Bonus, entry is free! 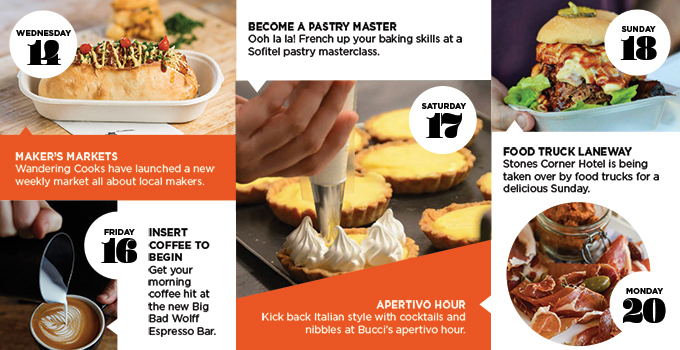 Monday 20th October Apertivo hour | Bucci | Fortitude Valley From 5-7pm Monday to Friday, the Bucci bar serves up classic Italian cocktails and complimentary bar bites to help you get your tastebuds ready for dinner. Relax under the leafy canopy and sip Aperol Spritzes and Negronis while you nibble arrancini and stuffed olives. Tuesday 20th October Spring menu | Delfina’s Bistro | Fortitude Valley Haven’t had a chance to sample Delfina’s Bistro’s delicious feeds yet? Well here’s a great excuse to book a table: they’ve just launched a brand new menu perfect for sharing. If you’re already a fan of the Valley restaurant and despair of losing your favourite dishes, don’t worry, they’ve just been reimagined, and that pork belly and slow cooked lamb is still on the menu. Food Trucks of the World | King George Square | CBD Want something a little different to your standard Tuesday lunch of sandwiches and a fruit cup? Head down to the King George Square and you’ll find a gathering of food trucks ready to tempt your tastebuds with their delicious street eats. Wednesday 21st October 2-for-1 eats | Kerbside | Fortitude Valley Kerbside has a 2-for-1 dinner deal every Wednesday night that will have you and a friend fed for less. Tuck into two crispy chicken schnitzels with salad and fries for just $16 – that’s you and your mate’s dinner sorted for $8 each! You’ll even have change left for a beer. Thursday 22nd October Winemaker’s dinner | Mondo Organics | West End Bannockburn vineyards and Mondo Organics have partnered up to put on an evening of gastronomic grandeur. 4 absolutely grape courses will be served on the night, each perfectly paired with a Bannockburn wine for $115pp, with dishes like grilled lamb fillets with pea basil puree and Cape Grim sirloin with stuffed trotter on the menu. Friday 23rd October Valley Fiesta | Fortitude Valley Held over 3 days, Valley Fiesta is a jam-packed music, art and food festival that boasts some of the best local bands and delicious food from the precincts best venues. Events over the three days include a Dinner Under the Stars in Bakery Lane and a Fiesta Feast, which will take over Chinatown for a day of food and booze, but you can check out the full line-up of events and plan your weekend here. Saturday 24 The End of the Line Festival | Woolloongabba The annual End of the Line Festival is returning to Woolloongabba with alfresco dining, live music, food trucks, market stalls, art installations and comedy. From 10am-10pm, the free festival celebrates Woolloongabba’s unique characteristics of food, music and eclectic wares, with plenty to eat and drink. Sunday 25 Movie night | Canvas | Woolloongabba For date night with a difference, snuggle up in Canvas’ courtyard under the stars and take in a classic movie on the last Sunday of every month. Tickets are just $10, and include popcorn and a cocktail while you watch favourites like Singing in the Rain and Ferris Bueller’s Day Off.